The book is written to inform, to encourage and as a handbook for potential and practising writers of historical fiction. It is structured in three parts. The first “Historical fiction”, presents the authors’ perspectives on their subject and a potted history of historical fiction. The second part, “Tips and tales”, is a collection of short essays or extracts by a selection of authors of historical fiction. Mostly the authors reflect in these pieces on the subject, or on their own writing. The final part, “Write on” is a combination of practical tips, exercises and encouragement for writing as well as a compendium of possible sources for historical background and detail. Celia Brayfield and Duncan Sprott are both themselves authors of historical fiction. In the first part of the book they each present some personal reflections on their subject – what it means to them, how they regard historical fiction. There is a sense in which all fiction (with the possible exception of science fiction) is historical. That you cannot not write historical fiction. The argument goes: even when you set out to write about your present-day, as soon as you have written it down it is already in the past. Even science fiction is frequently a commentary – conscious or not – on the author’s present day. This is why many works of cutting-edge SF can feel remarkable dated when read a generation later. “Historical fiction” is a genre, and genre is a product of the market place and the expectations of readers rather than anything that has to do with the core of creative writing. Some authors are comfortable writing in a genre, others are offended to be categorised as “genre writers”. There is a certain chip-on-the-shoulder quality about authors who find it important to establish the breadth, ancient pedigree and/or superiority of their genre. Brayfield and Sprott tackle this issue well, even entertainingly. Still, I detect a faint whining sound when I read the section “On being not quite proper” (pp16-18). To be fair, there is a prejudice against “historical fiction”. If the authors did not confront it they would open themselves to charges of ignoring the elephant in the room. They take the perspective that historical fiction is as old as story-telling itself. To this end they present an outline history of historical fiction that starts with Gilgamesh and Homer and reaches to the very near present. The middle of the book is given over to “guest contributions”. Twenty-eight practicing writers from Margaret Atwood and Tracy Chevalier via Philippa Gregory and Hillary Mantel to Rose Tremain and Louisa Young. (And despite the gender range of those examples, ten of the twenty-eight are men.) Each guest is given a page or two to present a few thoughts about historical fiction, meditate on their own process of authorship, or offer tips and encouragement to would-be authors. I imagine readers will be drawn to the authors whose work they already know. As most of these pieces seem to have been written specially for this volume, they may find something new. Reading them all one after the other, though, I was struck by the amount of repetition. For example, three or four cannot resist referencing LP Hartley’s famous opening to The Go-Between. “The past is a foreign country: they do things differently there.” (I’ve done this myself.) To be fair, the writers don’t all take the sentence at face value, but seeing it come up again and again made me realise how much of a cliché it has become. Unless I can riff a new slant on it I resolve not to use it any more. The book’s bias to its anticipated audience is particularly noticeable in the final part, “Write on”, in the compendium sections. Here the authors make an effort to present sources for historical research. They include some pointers for Australasia, North America and Ireland, but the bulk of their suggestions focus on Britain. I count only six out of a couple of hundred references made to sources in other languages than English. I don’t want to beat them up about this. The book does not set out to be comprehensive and it could be a guide to people working with sources in another country. You could think of the British sources as an example of the sources one might hope to find elsewhere. It would also be fair to say that non-British authors researching an historical novel set in Britain will find the suggestions valuable. 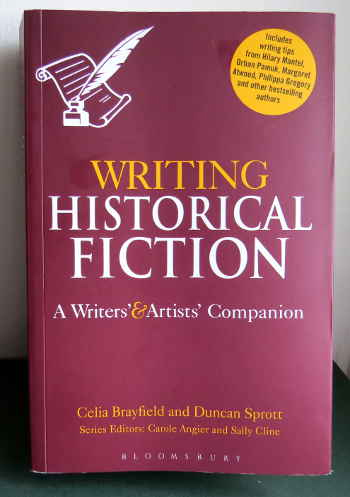 More generally useful, though, are Duncan Sprott’s sections in the final part (Planning, Beginning, Drafting and Troubleshooting) and Celia Brayfield’s writing exercises in historical fiction. In particular, Brayfield’s suggestions for finding historical voices, settings, objects and seeing the “street view” are excellent. I can definitely see myself using them. The suggestions for working with classes of would-be authors are more aimed at established writers running courses for others. As a former teacher I can see how these would also be useful, though they’re not for me at present. Apart from the exercises, the part of the book I most expect to be revisiting is the section of Celia Brayfield’s “Reflections” sub-titled “Heroine addiction: women as protagonists in historical fiction”. My own novel-in-progress has a woman protagonist and a largely female cast. For this reason I find several of Brayfield’s observations valuable and thought-provoking. In this section’s conclusion (p57) she writes “the consensual image of a prominent female figure will almost certainly be at odds with the historical record, and also with contemporary expectations of a woman” (emphasis added). Overcoming those parallel barriers successfully would be a great trick to pull off. In conclusion, Writing Historical Fiction is a book with a lot to recommend it. It will be most useful and interesting for beginning authors of historical fiction in Britain and the English speaking world. But it also has information, advice and encouragement for many people beyond this (after all) not so very narrow audience. I’m happy to have bought it and read it. And I’ll certainly keep it handy on my bookshelf so I can dip into it again. This article was written for the #Blogg52 challenge. Also published on Good Reads. I originally published this article on the separate At the Quill website. I revised it for spelling punctuation, carried out some SEO fine-tuning, and added a featured image before transferring it here on 10 April 2017. The new featured image includes a picture of the cover of the book superimposed on a background mashed up and photoshopped from two historical photographs. Both the original photos date from the late 18th century so are, I believe, out of copyright, though the website where I borrowed them may not agree. The Print Room of the Scottish National Portrait Gallery – search for “reading”.